Amazing Food, live entertainment and the best waterfront view in New Jersey! Welcome to Baia Restaurant of Somers Point, NJ... where contemporary Italian cuisine is matched with an unrivaled ocean view and exhilarating entertainment. Executive Chef Edward Bonsignore, Jr. brings a unique style and 'twist' to their culinary creations. The dining experience at Baia is based around an exceptional staff which excels in providing high quality ingredients and superior service to every guest. 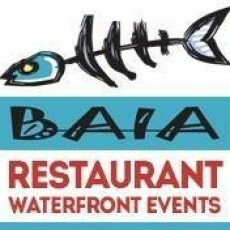 Baia's diverse menu features traditional Italian cuisine as well as an eclectic flair and flavor in a casual and entertaining atmosphere. Outside, you'll find a sun baked deck and crisp ocean air, partnered with weekly live entertainment and casual dining. Inside the restaurant, enjoy a more intimate dining experience, perfect for large families and groups of friends to gather. Ideally located near the 9th Street Bridge in Ocean City, Baia Restaurant of Somers Point is easily accessible by land or sea! Dock your boat and walk directly onto Baia's multi-level decks for an experience like no other at the Jersey shore. Looking for a Sunday Funday? A tradition for over 10 years, Reggae Sunday is a Jersey Shore institution! Featuring high energy entertainment from our reggae house band, Reggae Sunday is not to be missed....but arrive early to save yourself a seat for this weekly experience! Chef Ed and the staff of Baia restaurant look forward to serving you this summer. Due to our popularity, reservations are highly recommended.